This iconic trek covers more than 1100 kilometres, and takes visitors on a sightseeing adventure through world-famous national parks, sprawling canyons and majestic desert scenery. Alice Springs to Glen Helen is the first leg of the trip, and a drive between the two will bring you up close to history, nature and even the stars. Start your adventure in Alice Springs – the heart of the outback – where you can experience a sense of peace and tranquility that’s impossible to find elsewhere. According to Australia’s Arrernte people, the region was formed by giant caterpillars, which settled down on the red desert sand to become the ridges of the East and West MacDonnell Ranges that border the town. 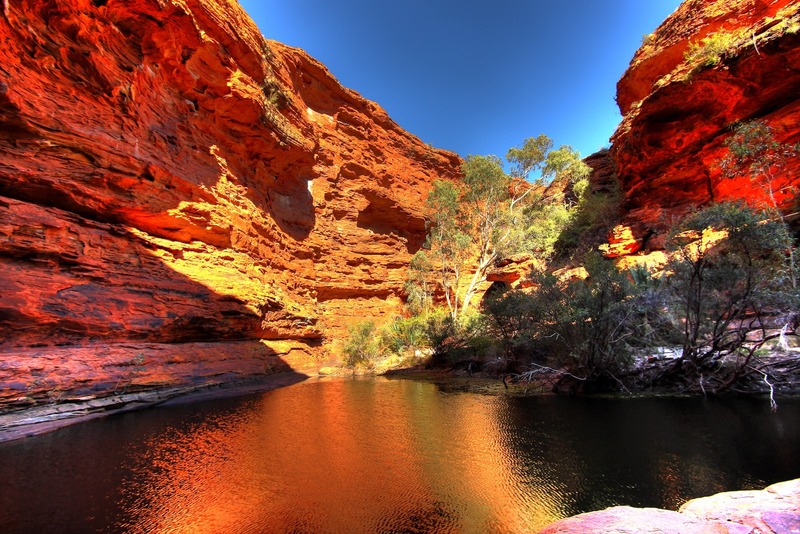 If you’re after an adventurous start to your journey along the Red Centre Way, take a four-wheel drive, mountain bike or quad bike tour of the desert surrounds, or choose from multiple walking and hiking trails in the West MacDonnell Ranges National Park. The park is also home to fascinating historical sites, like the grave of John Flynn – founder of the Royal Flying Doctor Service – and the Ochre Pits, a site that is still used by the Arrernte people today. Take a break from driving with a scenic journey to Simpson’s Gap and Ellery Creek Big Hole in the West MacDonnell Ranges, or take a ride in a hot air balloon over the park to let the warm desert air lift you up to an exclusive view of the entire region. While you’re there, don’t miss the chance to see one of the most stunning views of the night skies in the world! Central Australia is one of the best places on the planet to get an uninterrupted view of the stars: join an astronomy tour to see into some of the furthest corners of the galaxy, or simply set up camp under the heavens and watch for comets and falling stars at your own leisure.